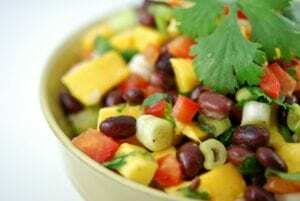 Mouthwatering black bean mango “bumblebee” salad. This mouthwatering black and orange “bumblebee” salad is a sweet and tangy crowd-pleaser that serves up fiber, protein and tons of vitamins. Enjoy it as-is, mix in with greens, or scoop it up on tortilla chips. Turn it from a side to a meal with a generous serving of quinoa. Rinse beans well in colander. In a large bowl, combine rinsed beans, bell peppers, onion and cilantro and any optional ingredients (heat or ‘boost’). Omit mango for now…it’s delicate. Add vinaigrette and mix well. Lightly salt to taste. Gently fold in the mango. Adjust taste with more salt, lime, cilantro, or “heat” as desired. The Percent Daily Values are based on a 2,000 calorie diet, so your values may change depending on your calorie needs. The values here may not be 100% accurate because the recipes have not been professionally evaluated nor have they been evaluated by the U.S. FDA. They often do not apply to children. Recipe credit: Adapted from SpruceEats and Gonna Want Seconds. Inspired by supernanny, Paula.